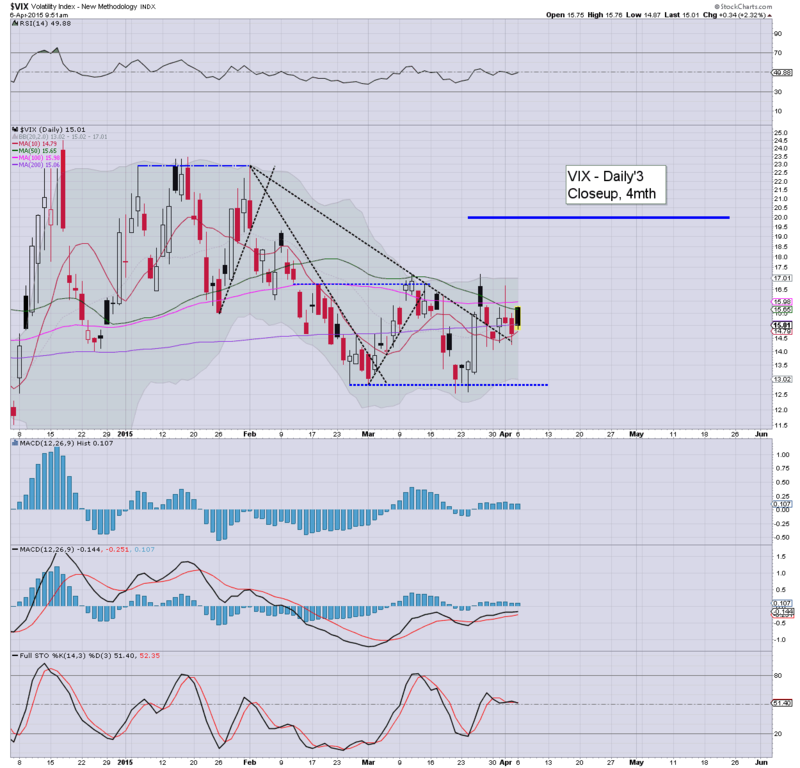 With equities reversing higher from the open, the VIX remained relatively subdued across the day, settling +0.5% @ 14.74. Near term outlook offers renewed equity weakness, which should equate to VIX making yet another challenge to break the double top of 17.19. 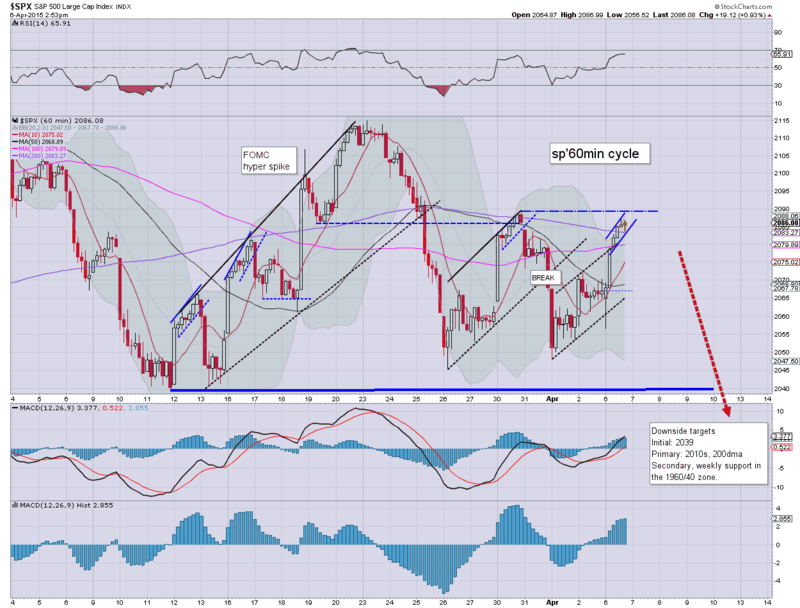 *I wanted to highlight the weekly cycle, since the MACD has ticked higher for the third consecutive week. There remains viable upside (if briefly) to the VIX 20/22 zone.. but that will of course require a clear break of sp'2039. VIX remains weak... but held up relatively well, considering the equity gains. If the market can't break above 2088... then renewed equity weakness.. with another push higher in the VIX... at least to the mid/upper 16s. US equities closed moderately higher, sp +13pts @ 2080 - having swung strongly higher (intra high 2086) from an opening low of 2056. The two leaders - Trans/R2K, settled -0.4% and +0.4% respectively. 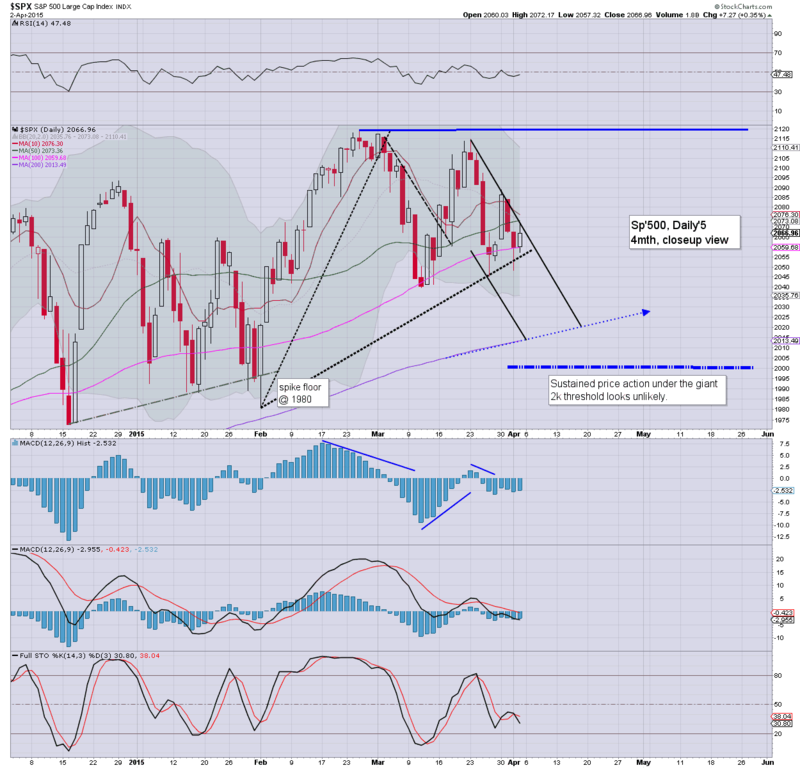 Near term outlook is bearish, with another attempt to take out the key 2039 low by Wed/Thursday. *closing hour was pretty weak. ... well, that is one way to start the week..
Market washes out the weaker bulls at the open... but then reverses... from 2056 to 2086.. .a full 1.5% swing. Yet.. closing hour weakness, a BREAK/fail of the bullish F flag... and the setup is now very bearish across tomorrow, and probably the rest of the week. Regardless of the exact close, the equity bull maniacs look set for a moderate victory (not least after lousy jobs data), with a sig' daily gain of around 1%, but more importantly.. above the 50dma of sp'2073. Any daily close above the 2088 high.. would bode badly for the bears.. but 15/60min cycles argue against any higher. Price structure is a rather clear bullish F flag. It is HIGHLY notable that the past 3 flags have all failed. So.. unless bulls can keep on pushing.. Tuesday will see a strong swing lower.. and once again, it will be a case of whether the 2039 low can be taken out. Best guess... market will remain stuck <2088.. .and break lower tomorow morning. Without question.. this year is turning out to be a real mess... stuck between sp'1980 and the recent historic high of 2119 - a 7% range across the last 9 weeks. 3.08pm.. Market looks maxed out at sp'2086.... VIX looks floored. Hourly MACD cycles are turning... bulls have a problem into tomorrow. 3.19pm.. The F flag is in danger of being broken into the close..... 2080 would clarify matters. 3.41pm. Provisional FAIL of the F flag.... VIX set to turn positive. Rats getting twitchy.... back at the close! US equities are holding borderline significant gains, but market looks to have maxed out just under the March'30th high of sp'2088. Some degree of weakness into the close looks highly probable, although equity bears can't get overly excited until back under the 50dma of sp'2073. 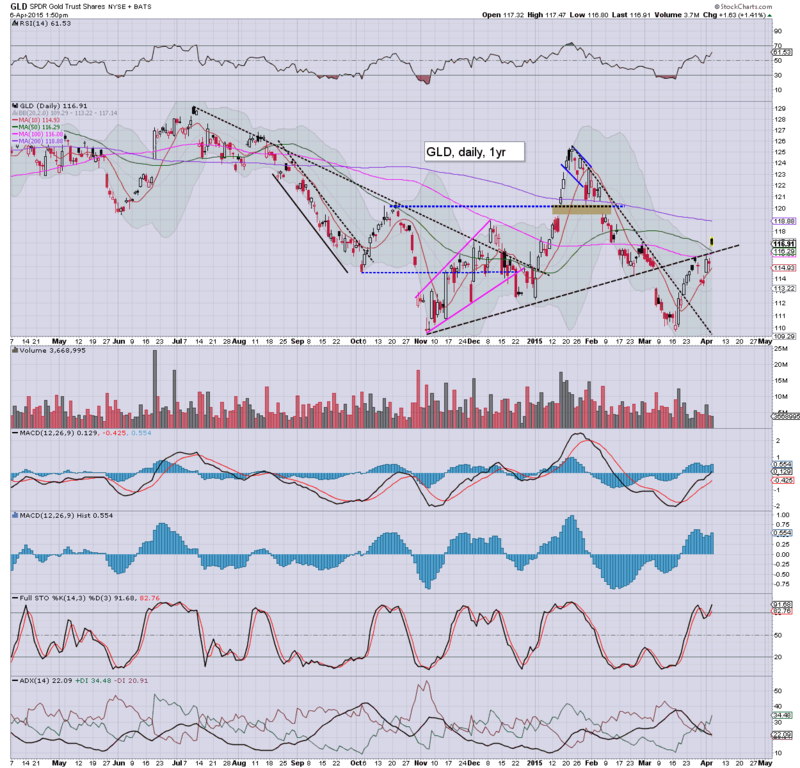 *a notable black-fail candle Gold (and Silver)... bodes for renewed downside later this week. So... we've held just under the sp'2088 high, but it'll take a fairly sig' down wave into the close to get back under the 50dma. All things considered.. the next hour is prime opportunity to exit longs and/or re-short.. as the smaller 15/60min cycles are arguably maxed out. US equities are building borderline significant gains, with the sp +17pts @ 2084. Next resistance is the March 30th' high of 2088. Equity bears should be desperate for a late afternoon rollover, with a close back under the 50dma of 2073. 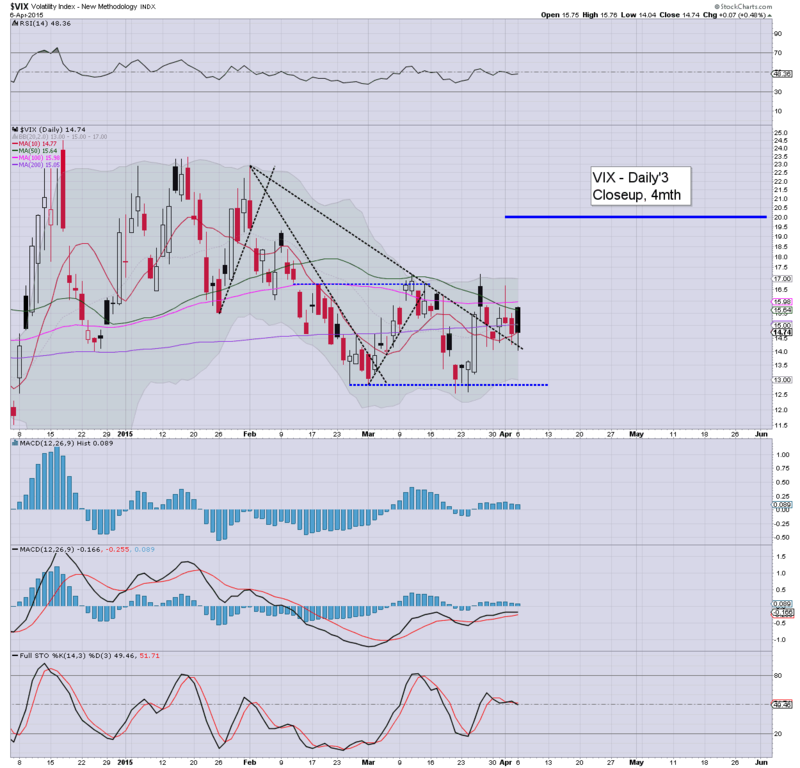 VIX is not particularly confirming the equity gains, -1% @ 14.51. With three hours to go... bears really need to whack this market lower into the close. Anything above 2073.. and it bodes for continued strength tomorrow.. if not to the sp'2110s. Oil is really helping the energy sector, +4.6% in the upper $51s. 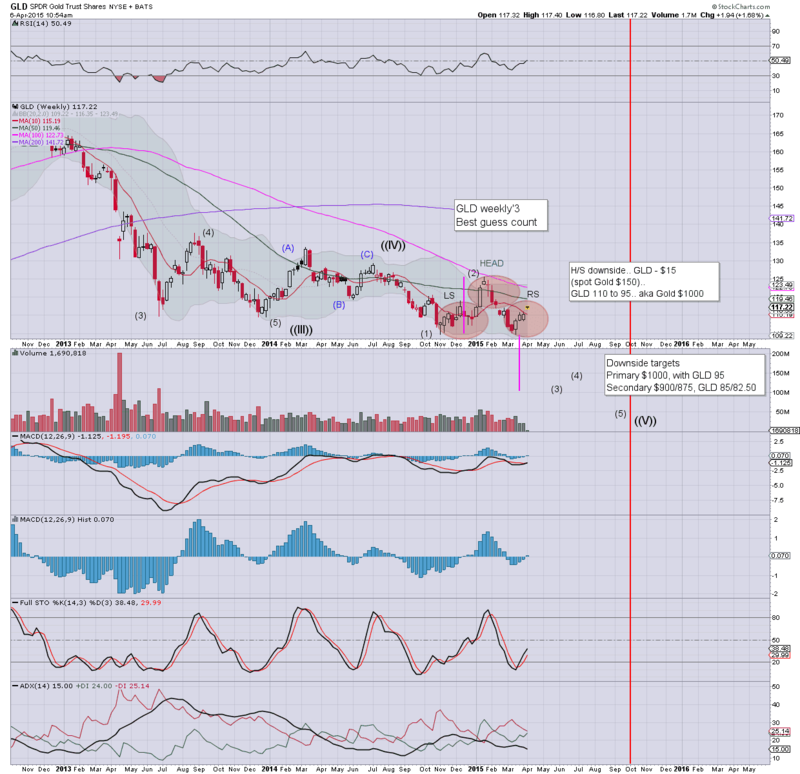 notable strength: TSLA +8.0% @ $206s. Whilst the rest of the market is building moderate gains to sp'2082, the 'old leader' - Transports, is not buying any of this mornings nonsense, currently -0.2%. The bigger monthly cycle for the Trans remains an increasing problem, with the last 4 of 5 months... net lower. Transports is indeed an issue.. but still.. bears need to take out rising trend.. around 8250, to cause some real concern. As for the broader market.. without question, equity bears need a daily close back under the 50dma of sp'2073. Considering we still have a long afternoon ahead.. there is plenty of time for a rollover. time for tea.. or something stronger. The reversal is so far holding with a high of sp'2079, but it is typical turn time.. and market looks vulnerable for the rest of today. Metals are holding strong gains, Gold +$19. Oil is similarly significantly higher, +2.9%. *Gold bugs are naturally getting excited at the imminent end of the financial world. However, I would agree with Oscar.. there is a clear H/S formation.. from the Nov' low. Natural downside target would be the $1000 threshold. No doubt... any gold bug would be dismissive of that.. but then... they have been dismissive of downside since the $1900s. So.. opening weakness, a strong rebound... but frankly.. this merely looks a place for longs to exit.. and anyone who wasn't short from last week.. to re-enter. In many ways, it is arguably just the same old algo-bot nonsense.. running stops.. on both sides. I'd guess Riley will also suggest that later today. 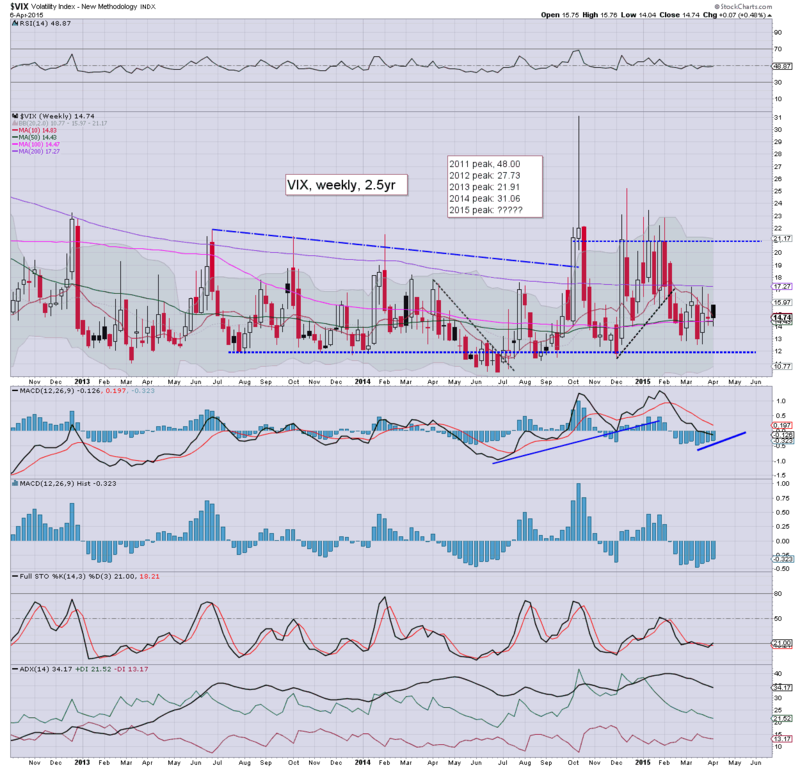 *It is notable that despite the index gains of around 0.5%... the VIX is a touch positive. 11.30am.. sp'2080..... VIX still.. fractionally positive. Oil gains are helping market.. +3.8%.... but hell... supply issues remain a problem.. completely unaddressed. US equities open somewhat lower to sp'2056, but there is a clear reversal in progress.. as reflected in a VIX that is still not showing any real upside kick. Metals are holding strong gains, Gold +$18, whilst Oil is +1.6%. Classic reversal candles all over the place... with a black-fail on the VIX hourly/daily cycles. Utter failure for the bears. Despite the open... bulls need a daily close above the 50dma (sp'2073) before they can get confident that the mid-term trend is turning back upward. Best guess.. bulls fail to close >2073... with renewed weakness across this week. 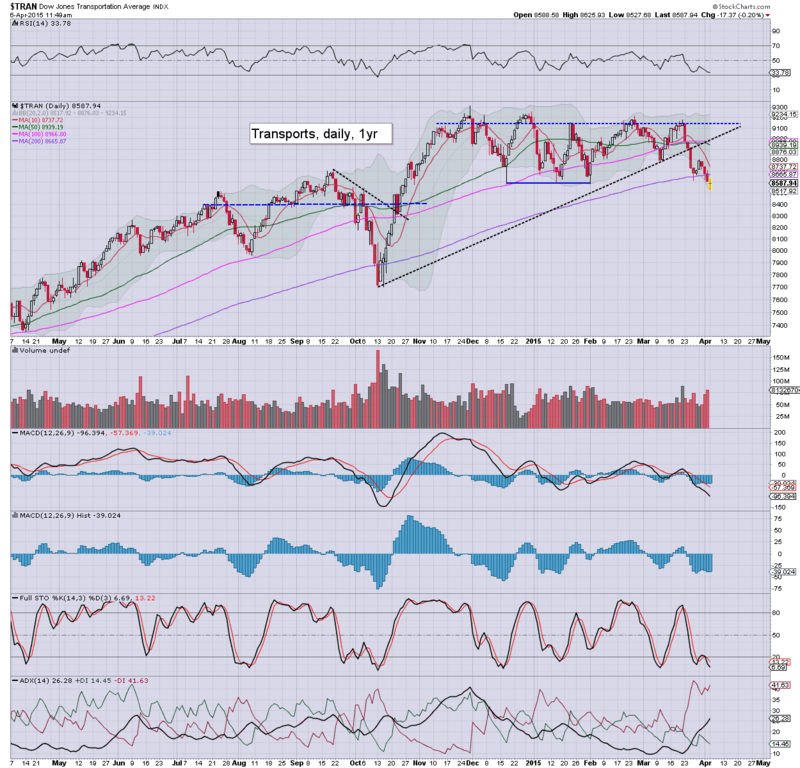 It remains notable that the Transports looks particularly ugly. 10.01am ISM/PMI service sector data both came in 'reasonable'... certainly, not reflecting the recent recessionary Chicago PMI. 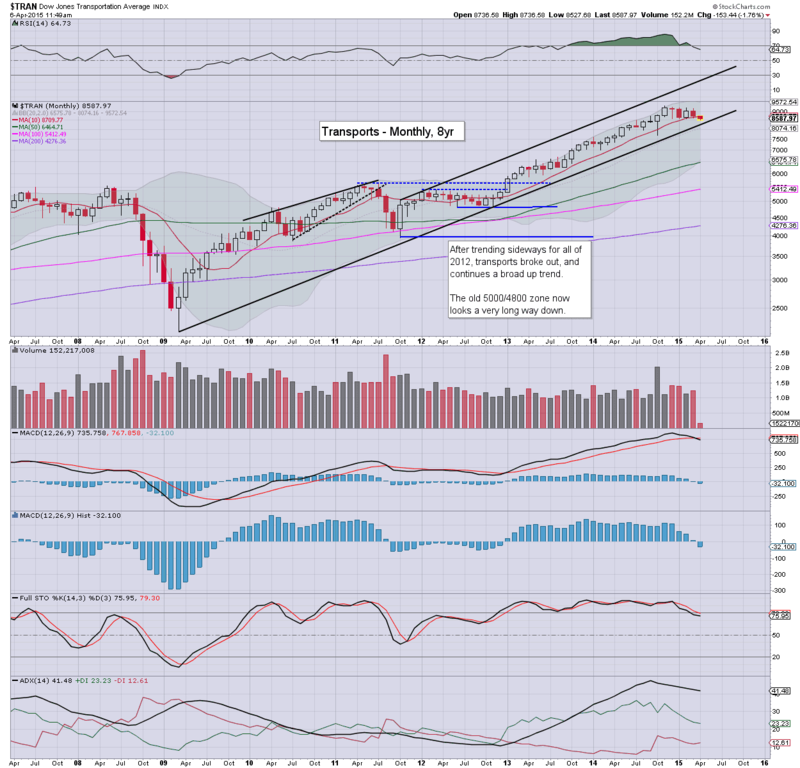 ... so far... no one wants to buy above sp'2070. There are a LOT of black-fail candles right now.. including energy. In many ways... equity bulls are getting an opportunity to make a run for it. 10.28am.. sp'2075... taking out the short-stops at the 50dma. Now its a case of ..close above.. or below. Any close much above 2073 negates any further downside hopes. Is it time for Greece to issue another 'give us money or else' headline? 10.31am.. A 22pt (1.1%) swing in the opening 60mins of the trading week. VIX weekly cycle is offering something interesting.. but more on that later. TSLA +7.4%.. but starting to cool... as the shorts have mostly all covered. Good morning. Futures are moderately lower, sp -14pts, we're set to open at 2052. Metals are sharply higher, Gold +$18, with Silver +2.0%. Energy is mixed, Nat' gas -2.4%, whilst Oil is +1,2%. So... after last Friday mornings lousy jobs data, we're set to open lower, but as usual, its nothing significant. All equity cycles favour the bears, and in theory, we have a fairly high chance of breaking the the key low of sp'2039 late today/early tomorrow. 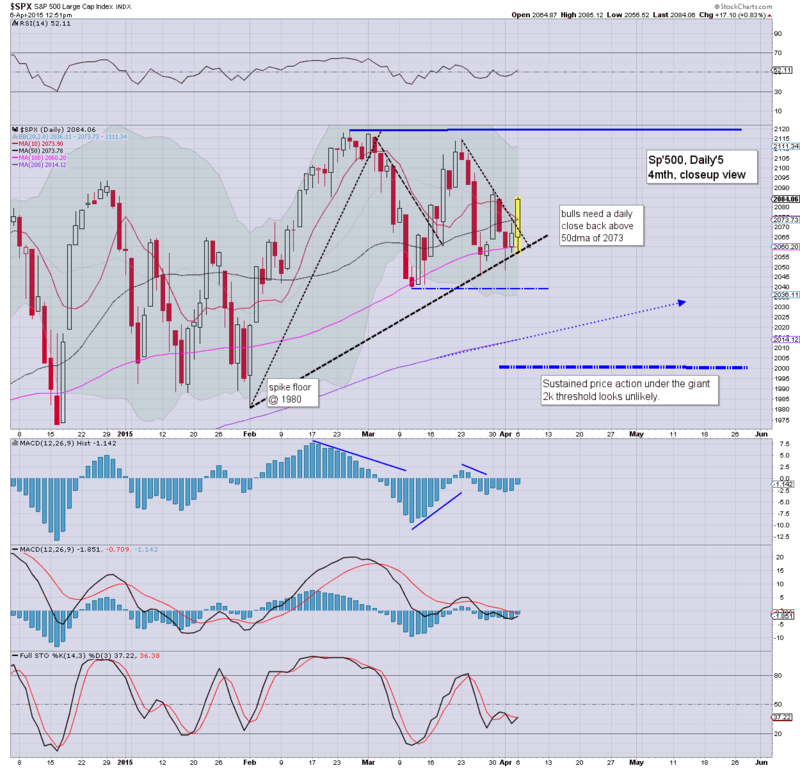 A break of 2039 will open up a test of the 200dma in the sp'2013/15 zone. It remains notable that the Transports has already completely failed to hold that key MA. notable strength: TSLA +3.9%, after Friday sales data.